Hi My name is Barry and I feel like bit of a fraud on here. 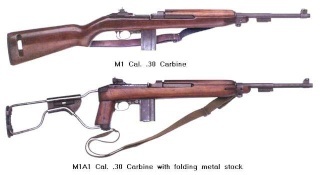 I only have the one carbine a late Inland M2 over stamped M1. Pot belly stock. Bayonet lug removed to keep as A cat. I collect other military rifles but this is the only semi auto I have kept. Sold all the others off to buy Martinis but could not part with the M1. This is the second carbine I have owned and I still regret parting with the first. I have a couple of bayonets and other Carbine bits. I would like to purchase a "Fixed" M1A1 stock. That is fixed in the open position to keep things nice and legal. Repro would do. Lovely guns to own and shoot but you must know that or you would not be reading this. Sounds very much like you have the Carbineitis that is mentioned often by owners of the M1 Carbine, they just seem to get under your skin, and form a bond with their owners and it's well highlighted by your regret with selling one previously. I'm sure if the opportunity presented itself you would happily buy another M1 carbine, so sounds like a collector to me! I also note that there seems to be a bit of a hot spot of Carbine owners in the Wellington area, good to see, and hope you are able to help one another out if you happen to cross paths. Hope to see some more posts from you in the future. Thanks for the warm welcome Alex. I'm a member of the Antique Arms Assoc and The Wgtn Srvice Rifle Assoc. Not that I get to shoot much these days thanks to the pressure of work. Almost 32 years ago I bought a Rokola carbine from an N.Z. vet who brought it back from Vietnam. Loved it and used it in competition at Trentham for a few years (Practical Rifle. W.M.S.C) To keep competertive I moved on to an AR15 and AR180. Alas with four children and a wife who all insisted on eating I had to sell off something and the carbine lost. BIG mistake. Should have kept it. The joy of modern semi autos died when I discovered Martinis. Sold off all my semi autos (by now there were a few). Only kept my "new" carbine. Can't afford to collect carbines along with Martinis and vintage air rifles but I'll always keep "my baby".